Sony’s UBP-X800 takes every disc in your collection to the next level. Whether it’s the latest special edition box set of Star Wars, or your favorite BBC nature series, we all have films or TV shows we want to watch over and over again, without the possibility that the streaming gods will strike them from their catalog. Not to mention the fact that we all want to watch our favorites with the best possible image and audio quality. And while Netflix, Amazon Prime offer a fair amount of 4K HDR content, for the best performance that never goes away, you’re still going to need a disc. 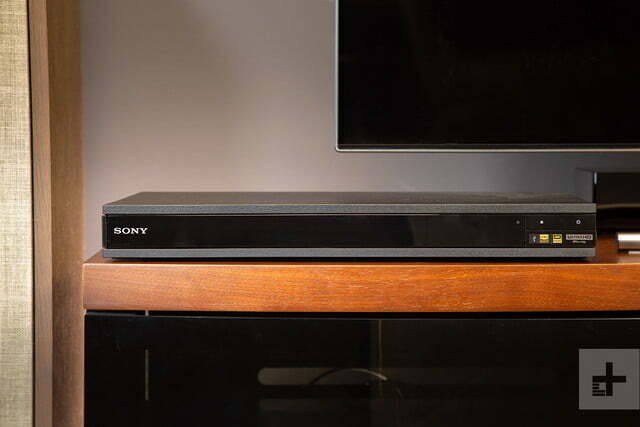 With its $250 UBP-X800 player, Sony embraces all kinds of disc-based enthusiasts. 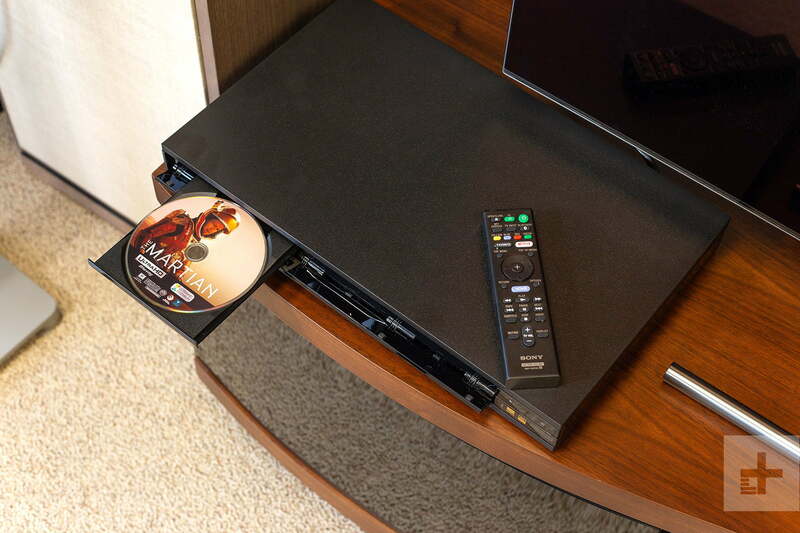 Whether you’re a cutting-edge purist who wants a truly theater-like experience at home, or simply a longtime collector of DVD, Blu-rays, and now Ultra HD Blu-ray discs, the exceptional Sony player will bring every disc in your collection to the next level. With a simple rectangular shape and an unassuming black paint job, the UBP-X800 isn’t flashy, but its textured exterior and hefty weight of over eight pounds combine for a premium feel. A simple Sony logo sits on the left side of the mirrored front panel, which folds down when the disc bay opens. There are power and open-close buttons on the right-hand side of the player, but they’re the only controls you’ll find on the device. To do anything else, you’ll need to grab the well-appointed remote, which joins a pair of batteries and a manual as the only other accessories. 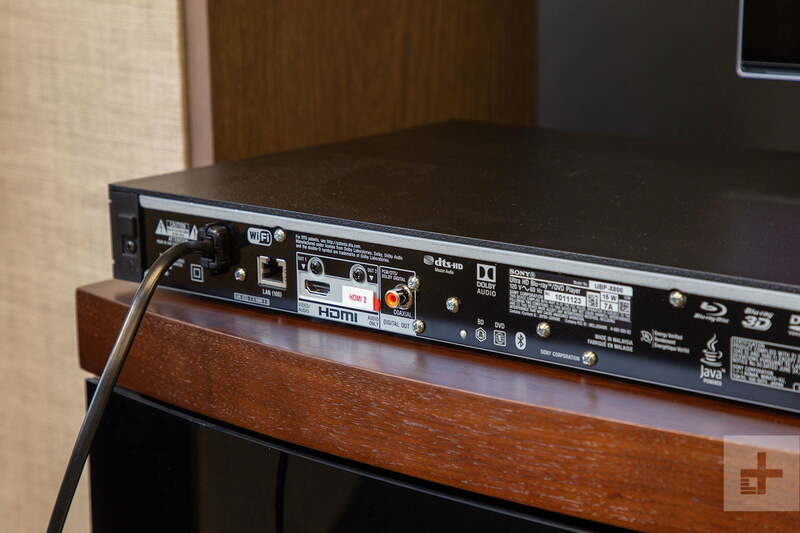 The rear panel of the X800 has two HDMI outputs — allowing you to output audio and video separately if needed — as well as coaxial and SPIDF audio outputs, and an ethernet port for steadier video streaming. Speaking of streaming, the player offers on-board apps for Netflix, Amazon Prime Video, and YouTube (among others), allowing it to moonlight as a streaming device, though you’ll be better off using a Roku, Amazon Fire TV, or other purpose-built streamer. The X800 will suffice in a pinch, but our favorite dedicated devices offer considerably better interfaces and more streaming options. The textured exterior and hefty weight combine for a premium feel. 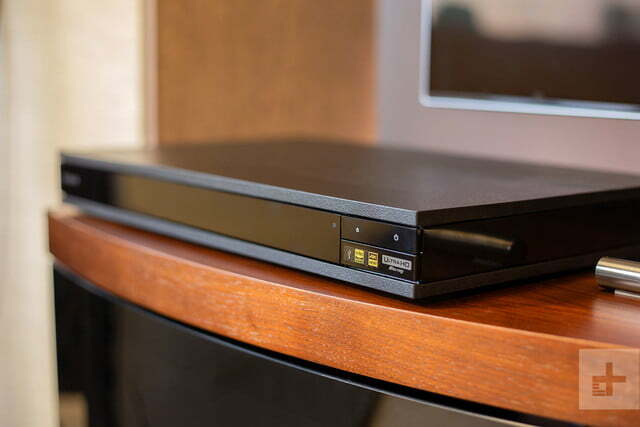 The X800 is built for discs, after all, and it supports them all, including Ultra HD Blu-ray, Blu-ray, DVD (both video and audio) CD, and Super Audio CD. Basically, unless it’s a laserdisc, this thing will spin it and send the signal to your system with gorgeous fidelity. In terms of HDR options, the player supports HDR10, but sadly, it doesn’t support Dolby Vision. This may or may not be of concern to you, depending on whether you own a Dolby Vision TV or not (which are still relatively limited), but it is worth noting that Dolby Vision devices and content is increasing. On the bright side, the X800 offers premium upscaling for your lower-definition discs, and, on the audio side, DTS:X and Dolby Atmos 3D surround sound. Should you use it as a network player, it’ll play virtually every audio and video filetype you can throw at it, including support for high-resolution audio at 24bit/96kHz resolution, along with everything from mp3 to ALAC formats. 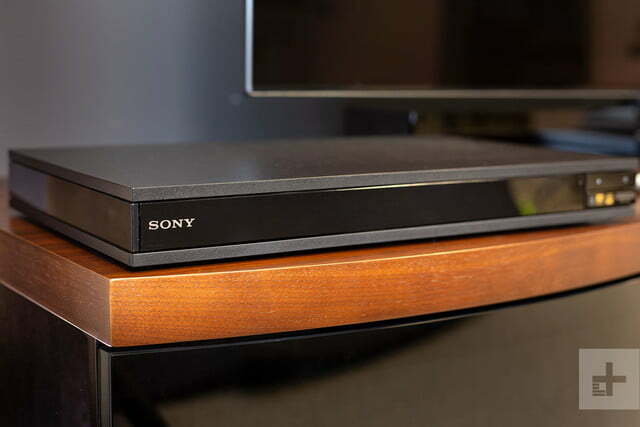 In fact, the X800 features the best audio processing Sony has ever put in an Ultra HD Blu-ray player, with special tools like the company’s DSEE HX (digital sound enhancement engine) that can upscale any audio — even lossy mp3s — to make it sound more dynamic and vibrant. Fans of streaming music will appreciate that the X800 also works with Spotify connect, projecting the album art and play count onto your TV screen while being controllable through your phone or tablet. If you don’t want to blast your favorite content throughout the living room, it also supports Bluetooth streaming for listening via wireless headphones. We mainly tested the X800 at home with a Samsung HW K-950 Dolby Atmos soundbar and a BenQ HT2550 projector, and were impressed from the moment we first powered it on. Regardless of what we played on the X800, be it Ultra HD Blu-ray or simple audio CDs, we loved the way it served up our favorite content. Sony has always impressed when it comes to image and audio processing, and it’s refreshing to see both working so well together in one device. When enjoying audio — we primarily tested the X800 with Spotify, but also tested out a number of CDs — we really enjoyed its ability to make audio sound more vibrant. Whether listening to our favorite new music or classics like Fleetwood Mac’s Rumours, the device offered a wider soundstage and a touch more clarity than Sony’s UBP-X700 model we recently tested. 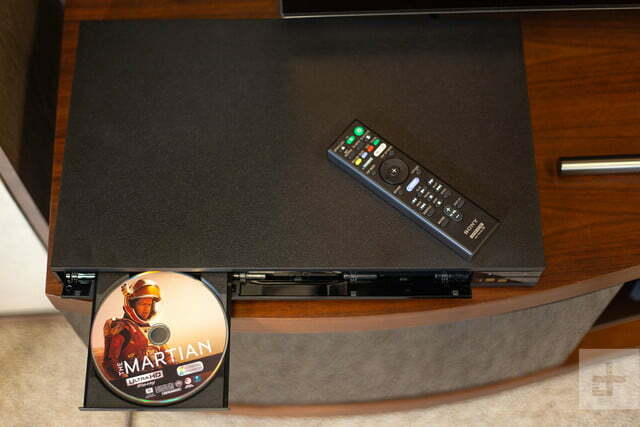 Both the X700 and the X800 offer the same incredible picture quality (save that the X700 does support Dolby Vision), which equates to vibrant color highlights and deep blacks when watching Ultra HD Blu-ray discs like The Martian. HDR10’s increased contrast and wide color gamut really did wonders to make everything pop on screen. Even when upscaling our Lord of The Rings: The Two Towers Blu-ray or an old DVD copy of Space Jam, every disc we plopped in the X800 looked clean and crisp on our display. Dolby Atmos performance is immersive and impressive, bringing you into the scenes in a way that just isn’t possible with a typical 5.1 or 7.1 system, even when using the relatively affordable Samsung soundbar. This functionality alone makes the X800 well worth considering over players without Atmos support if you’re a serious home theater junkie: There’s just nothing quite like object-based audio at home. Sony offers a one-year warranty from the date of purchase for defects in materials or workmanship. With the ability to play back any disc in your collection — audio included — with incredible quality, the Sony UBP-X800 is a great centerpiece for your home theater, and it won’t cost you an arm and a leg to get it. Perhaps it’s unsurprising that our other favorite UHD Blu-ray player — and the closest competitor to the X800 — is also from Sony. 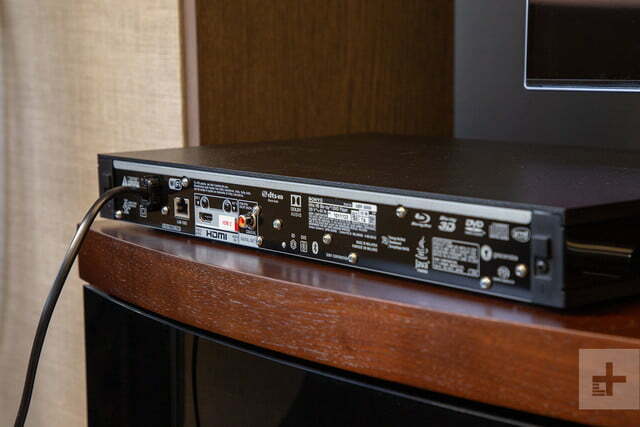 But while the UBP-X800’s little brother, the UBP-X700, does offer Dolby Vision support at its cheaper $200 list price, it doesn’t offer the same great DSEE HX audio processing. At this point it’s something of a toss-up. If you have a Dolby Vision-enabled TV, you’ll probably want the X700. Then again, everything you’ll play on any disc player has audio that you want to sound great, and the UBP-X800 has the upper hand when it comes to playing audio. Check out our picks for the best Blu-ray players for even more options. We expect the UHD-X800 to remain viable for as long as Ultra HD Blu-ray discs are, which is to say that you should expect many years of solid use from this well-built Sony player. That said, the lack of Dolby Vision support — a format that is increasingly popular — means you may end up wanting to upgrade to a device that has it in the future, should you get a TV with Dolby Vision support too. Yes. If you’ve got a sizable collection of discs from all generations of video and audio and are looking to see and hear them in excellent quality, this is a prime choice. It looks good, sounds great, and at $250, is a relatively affordable way to get premium sights and sounds.